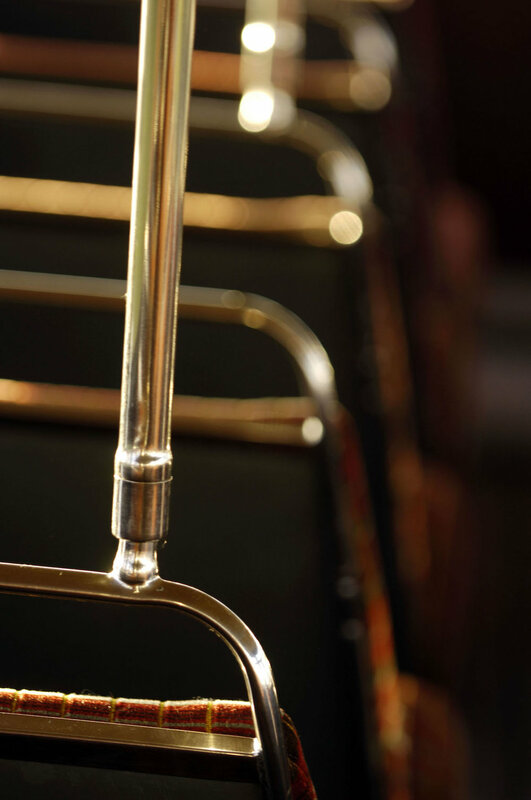 Our vintage Routemaster buses are available to hire. The double decker buses are perfect for weddings, corporate events or special occasions. Based in Edinburgh, book online now. Our three splendid vehicles have all been kept in vintage condition, complete with open platforms, authentic red livery, tartan moquette seating, tungsten lighting and plenty of chrome. The bus will arrive with fresh flowers and ribbons on both decks, uniformed driver and conductor with original ticket machine. And your own personal destination blind, yours to keep. Overseas visitors love to come on board for a tour of the Scottish capital or surrounding areas, or just to get from A to B. Edinburgh dwellers and guests from all over the UK love the vintage ride too. We cover an area within about 30 miles of our base in Edinburgh. Get in touch to discuss your location – we will try our best to accommodate you and your venue. We don't just do weddings and corporate events. We do special occasions, arts & music events, photoshoots and more. Find out about all the amazing special events we've done. The Red Bus | Looking For The Perfect Addition To Your Event? We’re so glad to announce that Java Dance Theatre are coming back on board this August for a three week run at the Edinburgh Fringe! This will be the third time we have collaborated with New Zealand based Sacha Copland and her talented team of dancers and actors. The last two runs of Back of the Bus sold out every show. Ah, destination blinds, now there’s something to really set the vintage bus enthusiast’s pulse racing. Not destination signs, note – in the old bus game it has to be blinds. The other day someone pointed at the open platform of RM1353 and asked me: did you take the doors off this bus? “No, it was built that way.” She looked amazed, and pleased. Here at The Red Bus we like to reward our most loyal passengers, and none of them go back further than Lewis. He was only two when he first jumped on RM1353 back in 2007. Now he is 12 so we asked him if he would like to drive another of our Routemasters, RM737, around the yard. He said yes! Two exciting bookings just confirmed: on May 26th we'll be at the Cockenzie and Port Seton Children's Gala. This is a unique community event where primary school children form a "court", parade around the East Lothian village on floats and even travel between the two harbours on fishing boats. The Gala has been running since 1949 and culminates in the crowning of the Gala Queen. Roll up for the wedding bus! If you ask people to come up with a bunch of the best wedding venues in and around Edinburgh, they might well choose impressive country houses like Hopetoun House, Prestonfield, Winton Castle, Gosford or Broxmouth Park. The Red Bus is delighted to announce it is repainting one of its red buses... red. I know, it may not sound earth shattering but at least one of us at The Red Bus had liked the idea of ivory "to make it more of a head turner". We are grateful to all those clients, suppliers and vintage bus enthusiasts who took the trouble to give their opinion on this crucial matter!